Turtle Cheesecake Pie - pecans, chocolate chips, caramel ice cream topping, cream cheese, sugar, eggs, sour cream baked in a frozen pie shell. CRAZY good! So simple to make. The hardest part is waiting on it to chill in the fridge before eating. It was pure torture! We inhaled this pie. Really simple and delicious! Recipe from legendary golfer Jack Nicklaus' family. Today is the first official day of The Masters. I thought it would be fun to share a recipe from legendary golfer Jack Nicklaus. Jack and his wife recently came out with a cookbook of their family recipes. I immediately ordered it. I mean, who doesn't want to know what the Golden Bear eats? LOL! There are ton of easy recipes in the book. The Nicklaus family eats good, simple food. Nothing fancy in the book. Perfect for us. 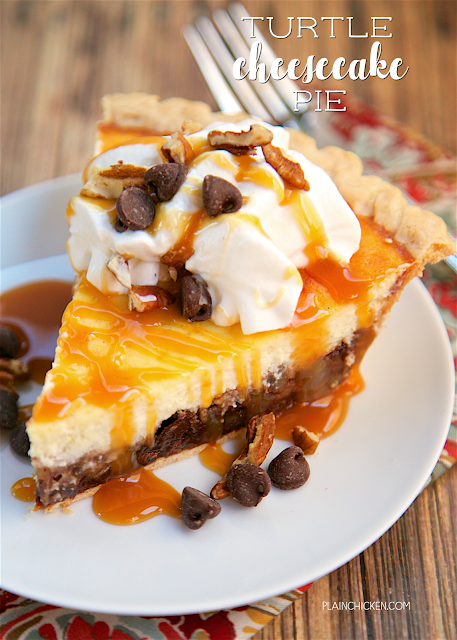 After look through the whole cookbook, I finally decided on the Caramel Chocolate Pecan Pie recipe. Have you ever heard of Turtle Pie? Turtle Pie is a combination of chocolate, pecans and caramel. It is the same combination as the turtle candy. A wonderfully delicious combination in my opinion. The Turtle Pie is said to have been created by the now closed California chain restaurant, The Velvet Turtle. 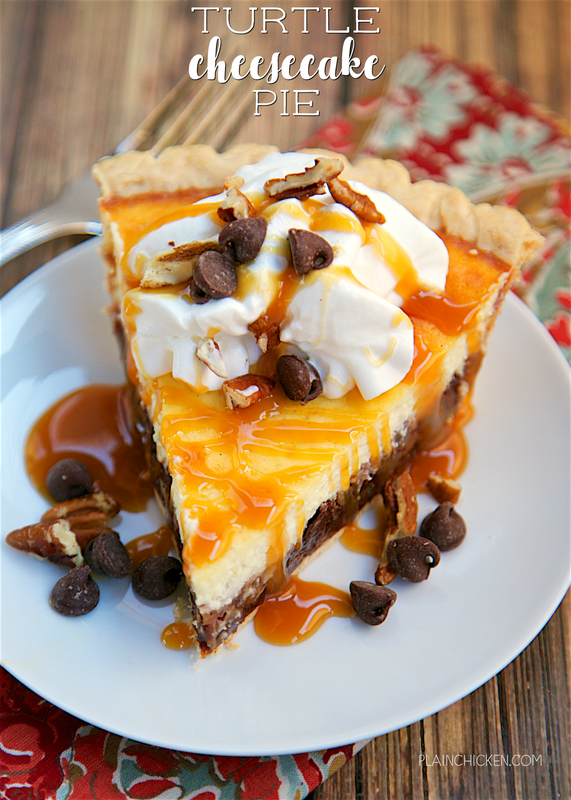 This Turtle Cheesecake Pie starts with an unbaked pie crust. I like to use a frozen deep dish pie crust, but you can also make your own crust from scratch. Either way this will be delicious. This pie only takes a few minutes to assemble. The hardest part about making this Turtle Cheesecake Pie is letting it sit in the refrigerator for an hour to chill. Pure torture!!! Once we could finally taste this pie, OMG, SO good! It is really one of the best pies we've eaten. Chocolate chips, pecans, caramel ice cream topping and a delicious cheesecake filling. It is CRAZY delicious! This pie is great for potlucks, parties or just a sweet treat. Give it a try! I promise it will be a hit! Sprinkle pecans and chocolate chips in bottom of pie crust. Drizzle caramel ice cream topping on top of pecans. With a handheld mixer, mix together cream cheese and sugar until thoroughly blended. Add eggs and vanilla, mixing well. Stir in sour cream. Pour into pie crust. Bake for 50 to 60 minutes, until center is set. Cool. Refrigerate for at least 1 hour before slicing. Top with whipped cream and additional caramel ice cream topping, pecans and chocolate, if desired. I just made this for my family and it was gone in one evening. they loved it so much!!! Thank you for all the great recipes!